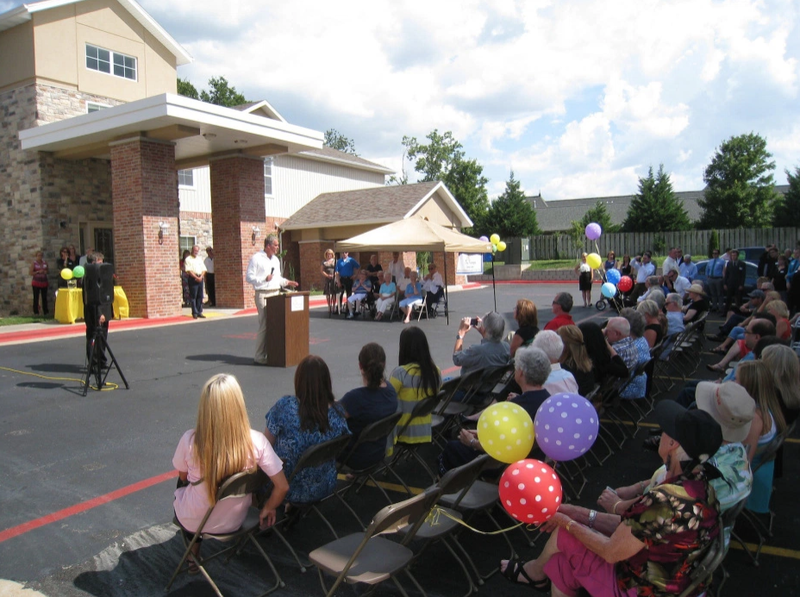 Matt E. Miller speaks to the crowd at the Grand Opening of The Fremont's Memory Care Facility and Assisted Living Facility. From downtown Springfield to western China, Jim Baker is making waves in economic development on a global scale. Baker, vice president for research and economic development and international programs at Missouri State University, was interviewed this morning by Springfield Business Journal Editor Eric Olson as SBJ's first guest of the year for its monthly 12 People You Need to Know breakfast series. At home, Baker is largely focused on the cultivation of IDEA Commons, an MSU-led movement focused on bringing together innovation, design, entrepreneurship and the arts in 88 center city acres. What started with the 2007 construction of Jordan Valley Innovation Center has blossomed into leased space in Brick City and the development of the Robert W. Plaster Center for Free Enterprise and Business Development in the former Willow Brook Foods turkey processing plant. Baker estimated the completion of the initiative would take at least 20 years and $100 million in public and private investments. The 120,000-square-foot Robert W. Plaster Center, which Baker said was purchased by MSU in 2009 for $2.8 million, is scheduled to open in March with a grand opening later this fall. The building is designed to house MSU's Small Business & Technology Development Center, offer class space for engineering students of Missouri University of Science and Technology and create a business incubator known as the E-Factory. "Essentially what we're doing is establishing a one-stop shop for small businesses," Baker said. "We want small companies to become big companies." During its Jan. 16 meeting, the MSU Board of Governors is scheduled to vote on whether to increase the budget for the phase two renovation of the Robert W. Plaster Center by $117,000 to $8.5 million. Baker noted businesses would be asked to move out of the incubator after reaching a certain size to keep the cycle of startup to big business rolling along. At leased space from Matt Miller Co. at Brick City, the university's art students attend classes, and a deal penned in late 2011 would allow the University of Missouri-Kansas City School of Pharmacy to sublease space in the building from MSU to open a satellite school likely starting next fall. The board of governors is scheduled to approve or disapprove the sublease during its meeting tomorrow. According to Baker, the UMKC partnership means more economic development, as well as additional workforce. "All the professors that come to reside downtown actually make quite a bit of money, and hopefully the pharmacists when they get out will make quite a bit of money," Baker said. "There's a huge shortage of pharmacists in southwest Missouri. The concept is that if a person gets trained here, they'll probably stay here." He noted MSU and its staff have historically impacted the local economy to the tune of about $1 million a day. Globally, the 20-year MSU veteran works to recruit students utilizing partnerships in China, and he is pushing this year for students from Vietnam, Brazil, Chile and possibly Russia. MSU inked a deal in November authorizing a Master of Business Administration transfer deal with Santiago, Chile-based University of Andres Bello. Baker said MSU has 1,426 international students in the states, roughly 800 of which are transfer students from China. Baker said he and other MSU officials look at emerging markets for potential partnerships, places where money is flowing or burgeoning. Through his connections, Baker has worked with the Springfield Area Chamber of Commerce in an effort to introduce local and Chinese businesspeople. "The Chinese market is like the Wild West; you can lose everything or you can do very well," Baker said. When working with businesspeople from outside of the U.S., Baker recommends patience, an open-minded willingness to learn the culture and treating others with respect. "The Golden Rule works in every country I've been to," he said. Bridging the gap among cultures in Springfield is MSU's downtown Foreign Languages Institute at the Jim D. Morris Center, a partnership between MSU, Drury, Evangel and Southwest Baptist universities and Ozarks Technical Community College that would prepare graduates for an increasingly global workforce. Courses are set to begin in the fall. H Design Group is proud to announce that The Monroe, University Housing at Missouri State, has achieved LEED Certification. The Monroe features such LEED concepts as highly efficient HVAC, lighting, window systems, and sustainable construction materials. This living/learning facility was built for the United Ministries Group in conjunction with Missouri State University. Its location within the Missouri State campus allows for a greater/easier/greener connectivity for the facility users to access surrounding public transportation opportunities as well as many public services. Project description: An expansion of The Fremont Retirement Community comprises two buildings: a 30,500-square-foot assisted living facility and a 7,300-square-foot memory care facility, according to Bryon Oster, project architect with H Design Group LLC. He said the two-story assisted living facility includes 56 beds across 48 single-bedroom and studio apartment units, a commercial kitchen, theater, private dining room, salon and Jacuzzi and workout rooms. The single-story memory care building comprises 16 beds across eight two-bedroom units, a commercial kitchen, sunroom, salon and Jacuzzi room. 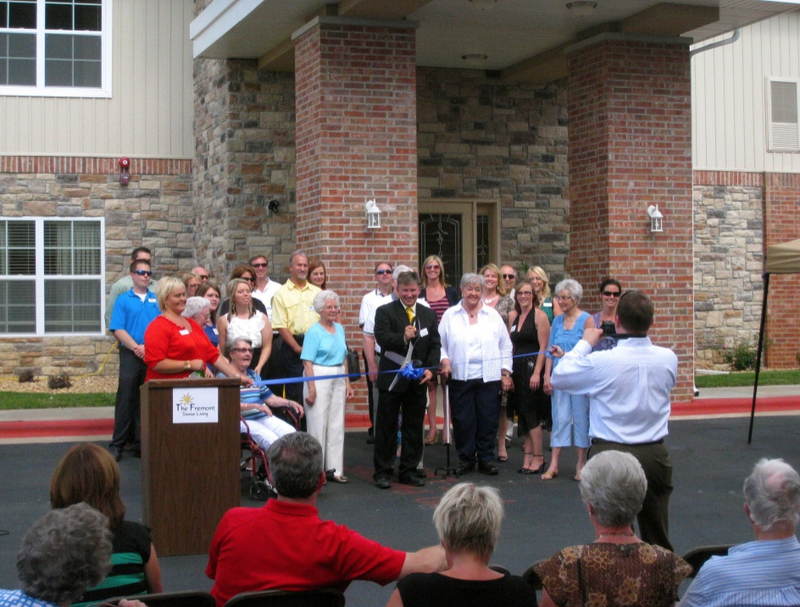 Fremont Senior Living Breaks Ground on $6 Million Memory Care Building in Mo. The Fremont Senior Living Campus in Springfield, Mo. is expanding with the addition of a $6 million assisted living and memory care building, bringing the total value of the campus to $14 million. Fremont Senior Living will get 56 beds of licensed assisted living and 16 beds of memory care to join its 22 existing villas and 33 apartments. The assisted living addition will provide personal care services, full-service, restaurant-style dining, and one-bedroom and studio apartments. On the memory care side, residents will have access to a home-like setting with innovative Alzheimer’s disease and dementia programming. With the addition of these buildings, the community will now offer a continuum of long-term care services in one location. The project is expected to be completed by the summer of 2013. Miller O’Reilly is the project developer, and Empire Bank is financing the construction. Lt. Gov. Peter Kinder and officials with The Fremont retirement community have scheduled a groundbreaking ceremony today for a planned expansion of the southeast Springfield campus. The Fremont, 1520 E. Bates St., plans to add two buildings and 56 assisted-living beds and 16 memory-care beds to the community's existing 22 villas and 33 apartments, according to a news release. The assisted living addition would add one-bedroom and studio apartments, as well as provide personal care services and restaurant-style dining. The memory care cottage would offer a home setting for seniors with Alzheimer’s disease and dementia. The new buildings, which are being designed by H Design Group LLC and constructed by Build LLC, are expected to open in summer 2013. According to the release, The Fremont is owned by Miller-O'Reilly Co. Inc. and managed by Arrow Senior Living Management, a St. Louis-based senior living management company. "The addition of senior health care services enables Miller-O'Reilly to meet a full spectrum of housing needs for Springfield from student housing to senior housing," said Pat O'Reilly, Miller-O'Reilly partner with Matt Miller, in the release. "It was our original vision to provide a healthy community for seniors to thrive. The Fremont expansion truly gives seniors more programs to meet their changing needs and fulfills our vision." Kinder and other officials will meet at The Fremont at 4 p.m.
“It is such an honor to have the state’s leading advocate for seniors recognizing the efforts of Miller-O’Reilly,” said Stephanie Harris, CEO of Arrow Senior Living Management, in the release, pointing to Kinder. “The Fremont has experienced tremendous growth during the past 12 months, which prompted Miller-O’Reilly to consider adding assisted living and memory care."